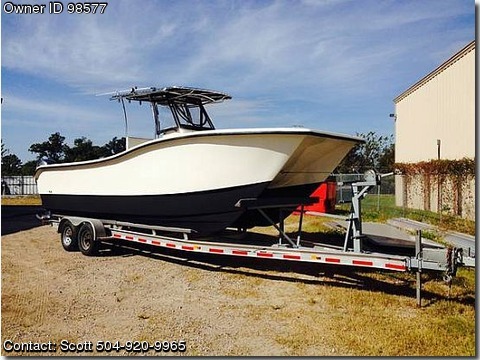 Boat is located in New Orleans,Louisiana.Please contact the owner @ 504-920-nine nine six five or scott@huntermarinegroup(dot)com...REDUCED PRICE!! New gelcoat, bottom job, wiring, & electronics. Garmin 3210 w/ Airmar 1 kw transducer, ICOM VHF, Fusion Stereo w/ 10'' subwoofer & 4 6.5 speakers, 2000 watt amp, 2 Deep drop plugs, underwater lights, battery charger, large custom fish box, 28 rod holders, custom livewell, 200 gal. fuel in hull, LED flood lights. Motors: 11/10 Yamaha F150's 4 Stroke. 2500 hrs. Just serviced and profesionally maintained. New hydraulic rams, teleflex, and helm. Boat is in mint condition and ready to fish. $69,500 WILLING TO SELL W/O MOTORS. DELIVERY AVAILABLE W/IN 300 MILES.